It is a well known fact that certain makes/models attract piles of parts cars much to the dismay of nearby neighbors. 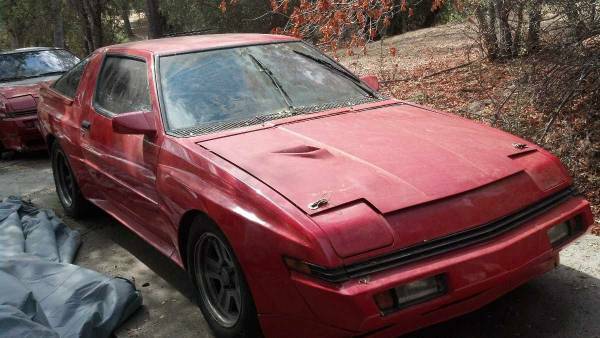 Triumphs are well known to have successful results in captive breeding programs but we've only recently discovered that the Mitsubishi Starion/Chrysler Conquest twins also grow like mushrooms in your yard. Famed Austrian School economist Ludwig von Mises predicted this free market mechanism in his treatise on "Rasenflächen und wie sie wachsen wie Unkraut Kutsche ohne Pferde" (Lawns and How Zey Grow Zee Horseless Carriage Like Zee Veeds). Find this pair of 1986/87 Mitsubishi Starions for sale in Yosemite, CA for $2000 obo via craigslist. Tip from KBZ. This pair of Mitsubishi Starions is offered as a package deal, no splitzees, no takebacks no givebacks. 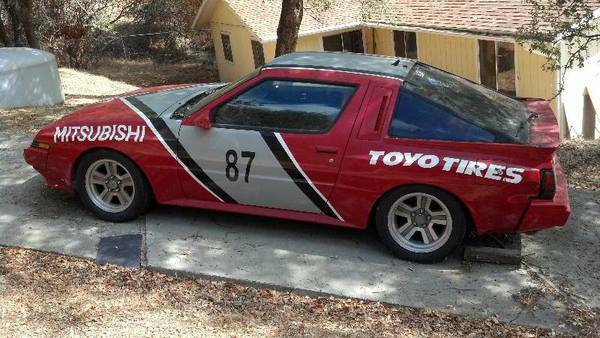 A thousand bucks a piece isn't a bad price to pay for a turbocharged rear-drive classic from the '80s and anyone with a few spaces in his garage or yard should take a look at this package deal. One of them even looks like it might be "race prepped." For what remains a mystery, but you can bet this guy has hordes of spares to go along with the beasts. Mises' Japanese counterpart, Katsuichi Yamamoto, believed that in order to have true economic calculation, profits and losses must be calculated by comparing prices and costs, which must be formed independently of each other in their respective markets or otherwise they will not reflect real conditions. In light of Hunsbloger's postulation that Starions are "the worst", we see the market calculation amounts to about 2 packets of ramen, despite the sporty paint job and free parts car. Analyses to the contrary are hereby sought. I'm going to admit that i really really want to restomod a widebodied Starquest at some point. They trade for the same prices as NA RX-7's of a similar age and condition but are much much rarer to find. 25+ years later the engines, turbos, and engine management can be made very reliable and can produce some decent power with modern components. The styling is unique and will always hold a bit of nostalgia for gearheads born between a very brief period of time.